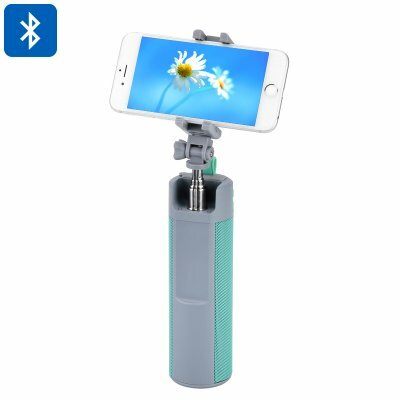 Successfully Added Bluetooth Speaker Selfie Stick - Bluetooth 4.1, 128GB External Memory Support, 5W Speaker, 2000mAh battery, 360-Degree Rotation to your Shopping Cart. The selfie stick itself features an adjustable length thanks to which it allows you to shoot the ultimate pictures. It can be rotated for 360-degrees and features no dead-angle. Thanks to this, you’ll be able to capture all that’s happening around you from every angle. Your selfie stick is easy to use without the need of any prior knowledge. Simply attach your phone and you’ll be able to shoot pictures of you and all your friends. From now on, not a single special moment in life will pass by uncaptured. This Bluetooth speaker selfie stick comes with an intergraded 2000mAh battery. This cell provides you with enough power to shoot pictures and listen to music for 8 hours in a row. With all this power at hand, you’ll be able to get through the longest of days without needing to worry about battery life. This cool electronic gadget is perfect for those of you that spent plenty of time in the outdoors. It allows you to capture and share all those fun moments you have together with your best friends. From now on, you’ll be able to recall memories and will never forget those special times you had in the past with your loved ones.